For years, I was an “S” girl, but pregnancy always reminds me how much I need those healthy carbs for energy and to grow a baby! This Trim Healthy Mama-friendly French Toast In A Mug proves that healthy carbs can be just as satisfying to the palate as a rich, fat-based S meal. You’ll not feel a wee bit deprived when you indulge in this protein-rich, quick to make, single serve breakfast or snack. Made without any special ingredients, you can enjoy this French Toast In A Mug just as it is, doused in sugar-free maple syrup, and/or with a pile of fresh fruit! You can even sprinkle a few blueberries (chopped apple is also delicious!) throughout the assembly of this French Toast In A Mug for an even sweeter burst of flavor after its finished cooking! My favorite brand of sprouted bread is Silver Hills, but you could also use two slices of Ezekiel Bread, Gwen’s Easy Bread, or a true whole grain sourdough instead. You can change the flavor of this French Toast In A Mug by adding more or less cinnamon (or other favorite spices), and experiment with swapping out the vanilla extract for one of the new Trim Healthy Mama Natural Burst flavors like maple, caramel, or pecan! This Trim Healthy Mama-friendly single-serve E version of French Toast In A Mug only takes 3 minutes to make and is a delicious way to enjoy healthy carbs any time of the day! Cut bread into one inch cubes. Whisk together egg whites, nut milk, sweetener, vanilla, cinnamon and salt. Lightly grease a microwave-safe mug with coconut oil or butter. Add enough bread to coat the bottom of the mug. Drizzle with a little of the egg mixture. Add a few more pieces of bread and drizzle with a little egg mixture. Continue alternating until the egg mixture is used and bread is coated with egg. Microwave for one minute (cook another 30 seconds if the bottom is still runny). Serve immediately with preferred toppings. Since this is an E meal, you can top your French Toast In A Mug with any fruit, or even cook your fruit (blueberries or chopped apple is especially delicious!) inside the mug! 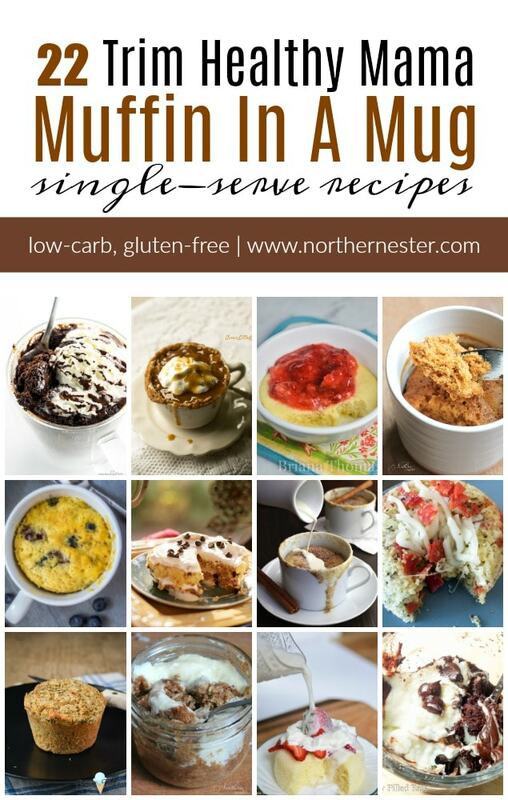 Looking for more Trim Healthy Mama single-serve Mug recipes? Here’s a round-up of 22 delicious options to try! Can this be made in the oven? I do not own a microwave. Yummmm! Thanks for this recipe! I added half an apple, cut into pieces, and fried it in my non stick frying pan instead of the microwave. Was ready in no time, and delicious with sugar free syrup! Mmmmmm, this is so delicious!!!! I’ve missed French toast for awhile so this totally hit the spot. Thank you! This was wonderful! What a tasty way to get an E meal in! Thank you for sharing! I love this so much! 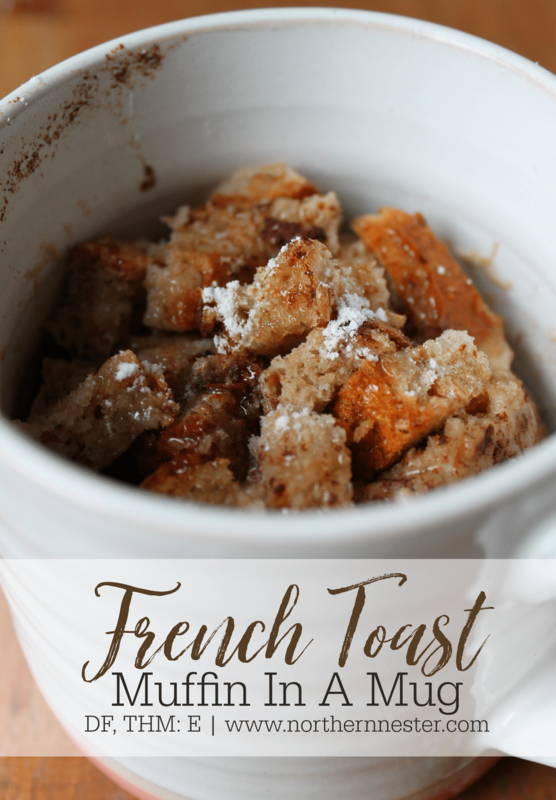 French toast is a favorite of mine and this is so much better than any other French toast in a mug recipes. Can this be made in the oven? I don’t own a microwave. Sounds and looks delicious!! Would you say it’s somewhat soggy….almost like a bread pudding? This is AWESOME!! I use THM super sweet about 1 1/2 teaspoons. I also find it easier to put my cubes of bread in the whisked egg mixture and then pour it into my bowl. I microwave for 1 minute and 25 seconds. Absolutely AMAZING! !